The Christmas transmission on December 24th, 2015 seems to be the most successful one for many years. A well tuned transmitter, together with advantageous weather and low background noise resulted in a record high number of listener’s reports. The final summary report includes over 400 QSL reports from all around the world. The most distant listener was Michel Delmarle / FR5ZX on Reunion Island, some 9,500km, straight line from Grimeton Sweden, who reported RST 529. SAQ was also heard with unusual strength in Wasilla, Alaska, USA, in many other US locations, in Russia and in many European countries. Special complements for a nice QSL report goes to the group of 12 german radio amateurs (DB1AI, DJ1WF, DC5OS, DO1OFR, DL3OMK, DJ8MP, DL1IMM, DK4OS, DL6OCA, DJ5FK, DL9AV), led by Carlo Struß (DL7CSX) who also sent a link with pictures from their listening event. Many thanks to All listeners for your interesting and detailed reports! For the first time in history, we also tried to broadcast live video from the transmission. 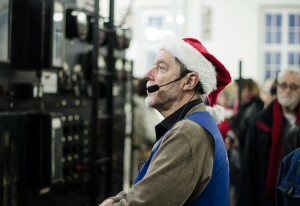 After some initial struggle, some 140 simoultaneous viewers, watched the start-up of the old Alexanderson alternator, performed by our “Alexander-gnomes” and the transmission, this year keyed by the “santa-telegraphist” Ulf Larsson. With the result in our hands, we will continue to develop the video broadcasting as a complement to the traditional reception via VLF-receiver or via Web-SDR. Here you can read and download the final listener’s summary report (download link), including every QSL report received by Email, bureau or mail, as per our QSL report instructions. Listener’s reports in our Forum is not included in this summary report. The final report will be published in a couple of weeks.